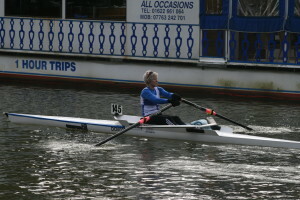 After several years absence, Dover Rowing Club entered 4 scullers in the Maidstone Small Boat Head race, which takes rowers from Allington Marina to the centre of Maidstone. 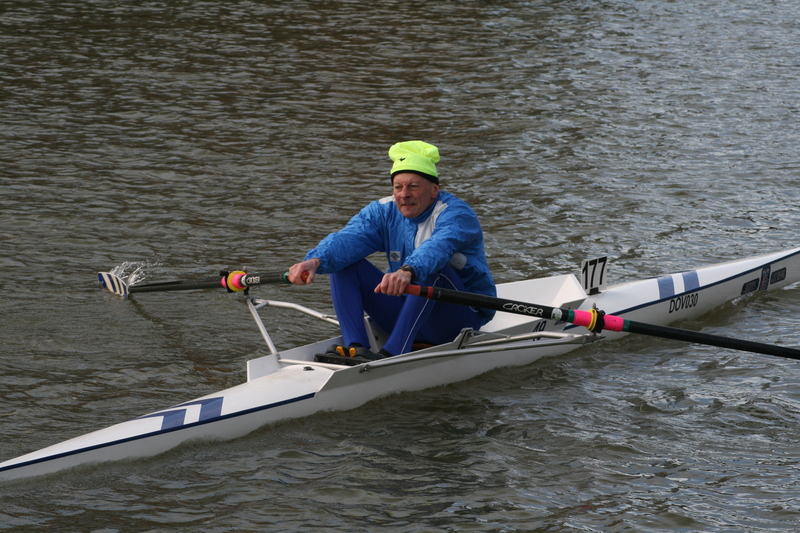 Dover’s team of Chris Hall, Jo Johnson, Nick Bailey and Chris Price competed in heavier, shorter coastal sculls in their races against the river clubs. 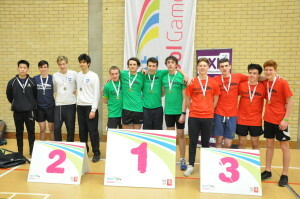 The event was divided into four divisions with different categories split across the grouping and in a time trail format. 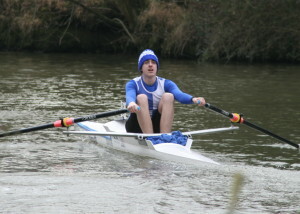 First on the water was Chris Hall rowing in the J18 class. Hall adjusted to this new style of racing and steadily closed on the pair boats ahead of him. At the first bridge Hall had overtaken one boat and was closing on a second before catching them at the second bridge on the course. 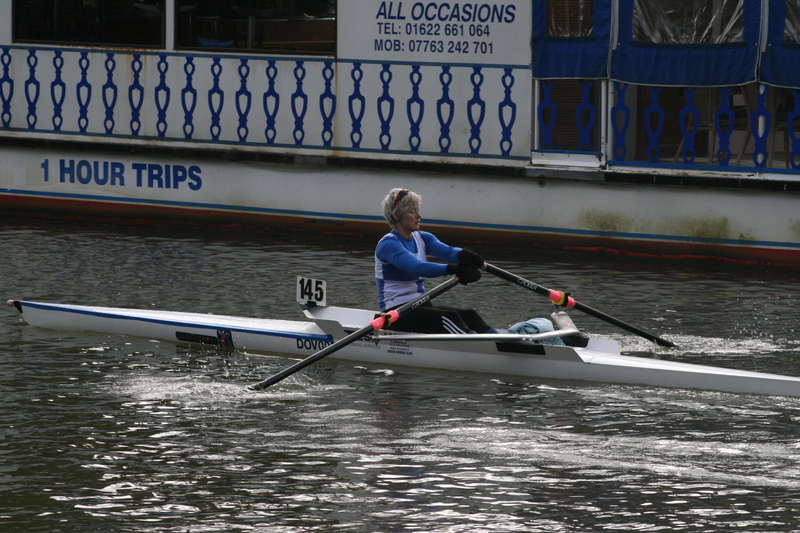 After avoiding a capsized boat Hall sprinted for the finish line securing the fastest time out of the Dover Scullers. 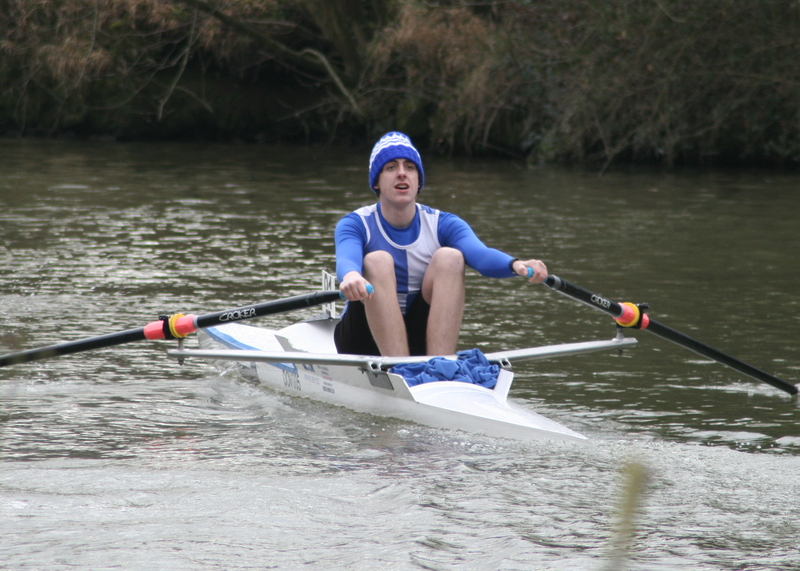 He was also the fastest single sculler in this division in a time of 11 minutes and 3 seconds and third in the J18 class. 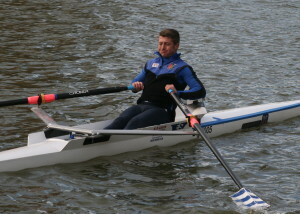 Johnson was competing as a single sculler for the first time at this event after previously racing in larger crew boats. Johnston worked hard through the first third of the event to maintain her position in the event order. In the second Johnston had a near miss with over hanging branches on one of the bends before crossing the line in 12 minutes 35 seconds and securing third place in the Ladies Novice race. The last division saw Bailey and Price pitted against each other, both rowers having previously competed in the event with Bailey racking up 40 appearances on the Medway. Bailey, rowing in the Intermediate class based on previous racing history, was the carrot for the younger Price to chase. By the first bridge it was clear that Price, racing in the Novice Category, was closing Bailey down, the catch happening near the second bridge, with Price having a several length lead at the finish. Price’s time of 11 minutes and 5 seconds secured him victory in the Men’s Novice class, whilst Bailey’s time of 12 minutes 50 seconds left him in third place in his group. This week saw the annual competition of Lent Bumps occur in Cambridge, with 31 colleges competing in a unique rowing race spread over 5 days where the aim is to try and ‘bump’ the boat racing ahead of you. 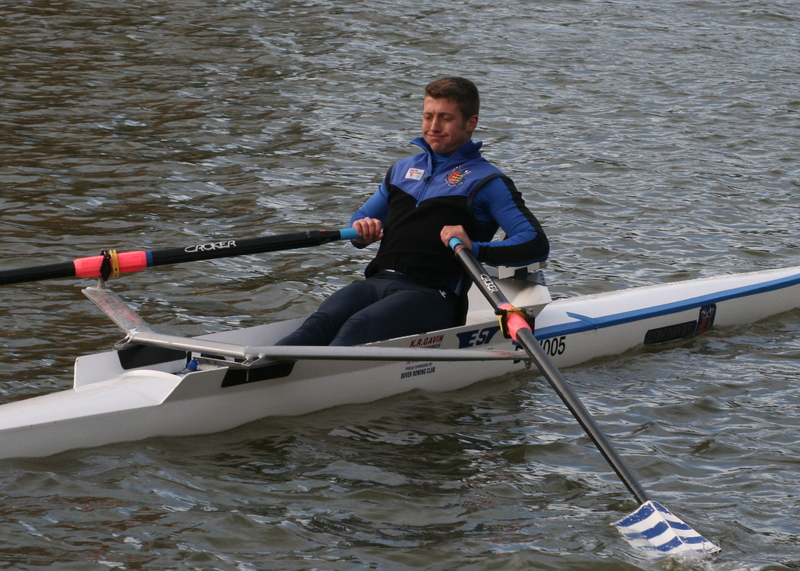 Normally events this far from home are not relevant to Dover, but this year I, a Dover rower, joined Gonville and Caius college (studying computer science), and have been rowing in the 3 seat of the Caius mens first boat. The races started on Tuesday with a rest day for the M1 and W1 divisions, with just lower division boats racing. I headed down the river by bike to watch some of the races, to get a feel of how each race is started. A cannon is used to signal 4 minutes to go, 1 minute to go, and the start itself, which is very loud and apparently deafens boats near it. It certainly is effective at getting the adrenaline pumping though! Caius M3 were awarded a technical row-over after a bump in front of them caused some chaos, Caius M2 achieved a row-over, however the women’s side did not fare as well: Caius W2 were bumped by Trinity Hall W2. Day 2 was a rest day for the second divisions, and was the first racing day for M1. 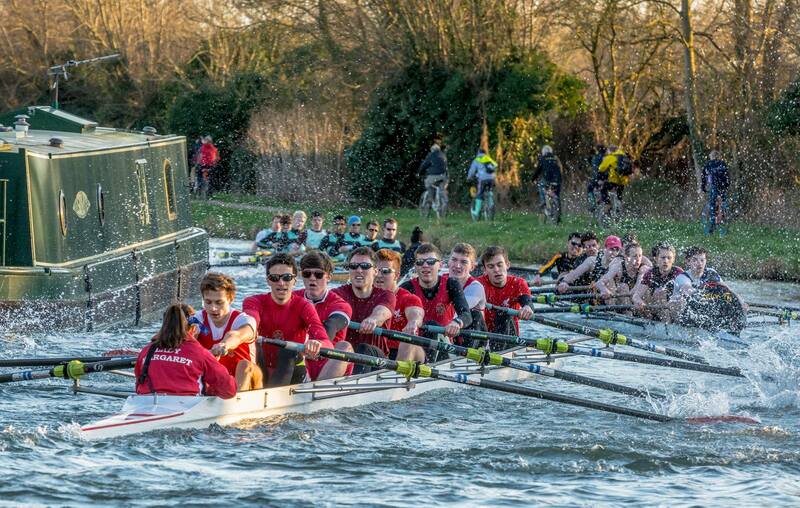 Caius M3 were bumped by St Edmund’s M2, but in the process were driven into the bank, damaging the boat and injuring the cox. The boat limped back to the boathouses taking on water, however the skilled hands of our boatman fixed the boat back to racing standard by the next day. 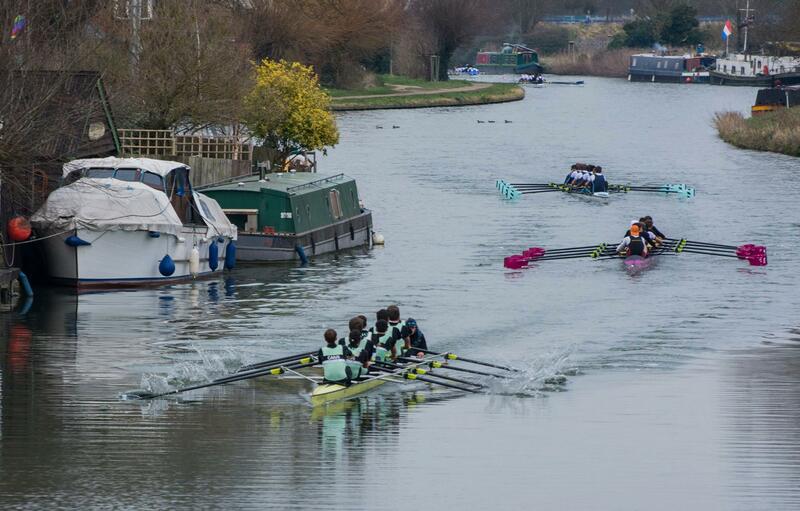 Caius W2 were again bumped, by Kings W2, and Caius W1 were bumped by Pembroke W1. The M1 race promised to be very interesting. 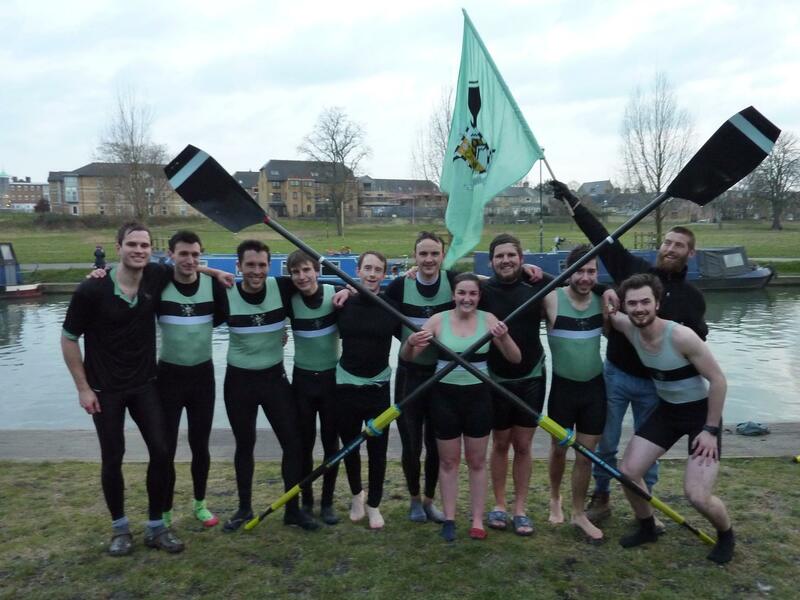 In a previous race, namely the Robinson Head 2 weeks prior, Caius M1 won with a 3 second lead on the second fastest crew, Downing M1. Downing M1 are also directly behind us in Lent Bumps. Confident that we were the faster crew over the entire course, we just had to contend with any pushes Downing made to stay ahead. With 4 minutes to go, we huddled together for a final crew chat. We just needed to row like we’d rowed many times before, strong and steady. We got back into the boat – 1 minute gun fires. You can see all the other boats lined up along the bank down the river, past the bridge, down to the lock. As the final 30 second countdown begins, our boatman pushes us out into the river and we sit ready. 10, 9, 8, 7 – square and buried – 6, 5, 4, 3— BOOM. 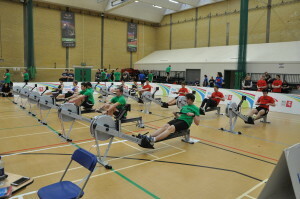 The start is completely unlike coastal rowing, you know exactly when the gun will fire, there’s no faffing with starting lines, and you know that the boat 1.5 lengths behind you will be pushing as hard as they dare to catch you. Our start is good, and we extend our 1.5 length lead to 2.5 lengths by the half way point, after the 3 corners. Downing now start their push, reclaiming that lost length to take them back on station for the last part of the race, but they cannot sustain the drive, and we row over with 1.5 lengths separation. Also of note are the fines and notices given by the race organisers to various crews. In particular: “Sidney Sussex M2 – Excessive greenery – race in a wooden hull fashioned from the branches for the remainder of the week” (crews that get a bump traditionally affix small branches torn from trees and bushes to themselves on the row home). Caius M3 were unfortunately bumped again by Pembroke M3, Caius M2 had some last-minute subs due to academic commitments, and were bumped by Lady Margaret M2, and Caius W1 were bumped by Churchill W1. The M1 race began in a similar way to the previous day. We extended a lead of about 3 lengths by the half way point, but as we approached the last 500m Downing put on a push, again finishing 1.5 lengths behind us. There was a highly optimistic whistle from the Downing bank party at this point; usually a single whistle means 1 length separation, 2 whistles means half a length, and 3 whistles means a canvas, but they never got within 1.5 lengths. 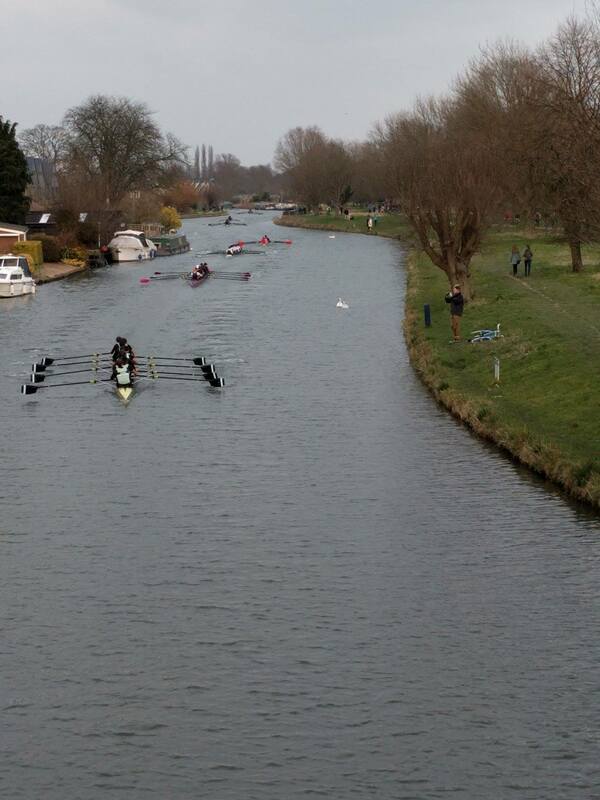 After a fierce race, Caius M2 were bumped less than 200m from the finish by Homerton M1. 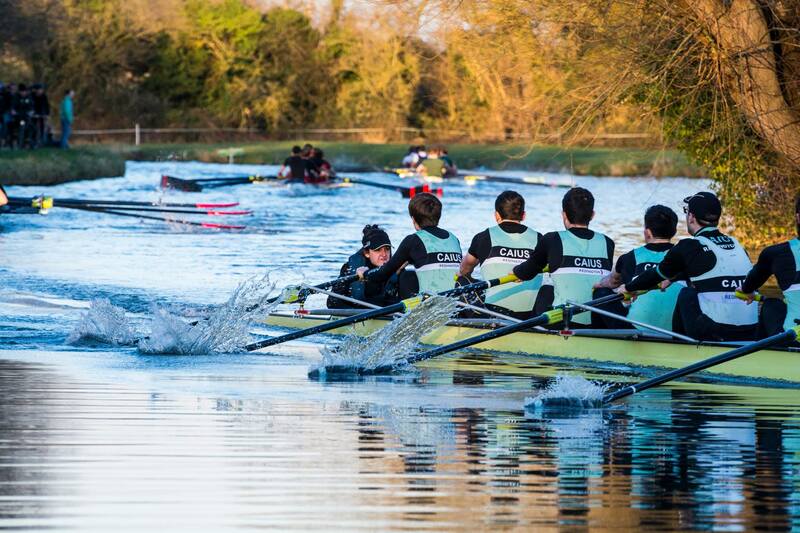 Caius W2 were bumped by Wolfson W2, and Caius W1 were bumped by Girton W1. In the M1 division, Downing had Pembroke behind them, who they knew were a fast crew from the bumps of the previous days. They pushed harder off the start, but we still extended our lead to 2 lengths for the majority of the course, finishing with 2 lengths distance. The consecutive days racing was really starting to hurt in all the crews. Caius M3 were bumped by Jesus M4, Caius M2 were bumped by Wolfson M1, Caius W2 were bumped by Downing W2, and Caius W1 were bumped by Lady Margaret W1. Our plan was simple: row the race we’d been rowing for the past 3 days, responding to any attempts Downing makes. This time we don’t pull out an early lead, with Downing really pushing to keep up. They keep the rate high up in the 40s way past the first corner in an attempt to get closer to us, but we keep them safely at 1.5 lengths. After the corners we lengthened with the tailwind, slowly pushing away from Downing. Pembroke got close to Downing, spurring them into a push, but nothing to worry us. As we passed the final bridge approximately 700m from the finish, we started putting down all the pressure we could. 2 lengths separation became 3, became 4. We were pulling further and further away and there was nothing the other crews could do to stop it. We crossed the line and retained the headship, welcomed with bottles of Prosecco and the Caius flag, which we paraded up and down the course. And then of course, we threw our cox into the water, as is traditional. Rowing at Dover really inspired me to push harder, go that extra distance, and keep going even when every fibre of my body is telling me to stop. 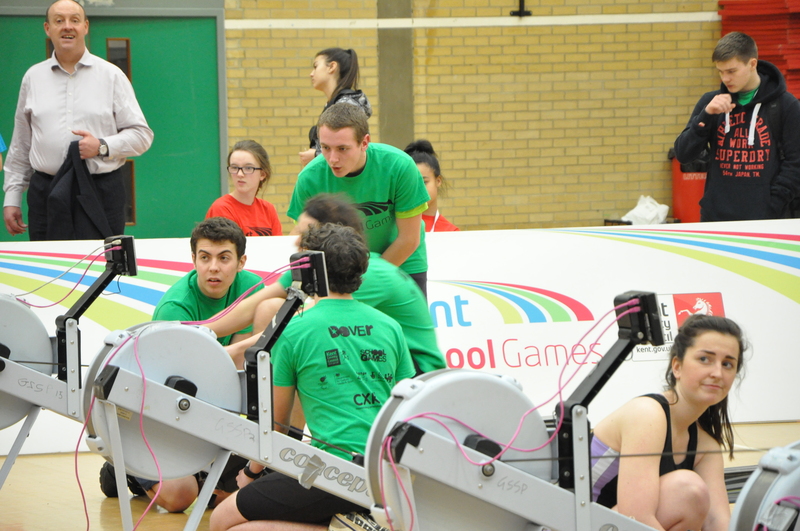 That determination from coastal rowing helped Caius retain the headship this week, and in no small part I’m deeply grateful to all the members of Dover Rowing Club who helped me take those first steps into rowing and progress ever higher. 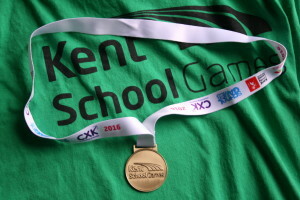 Dover Rowing Club’s Dover Grammar School for Boys contingent of Austin Mills, Cameron Mackintosh, Tom Stothart and Chris Hall all qualified for the individual and team relay event for the Kent School Games Indoor Rowing Finals in the year 12 / 13 category. 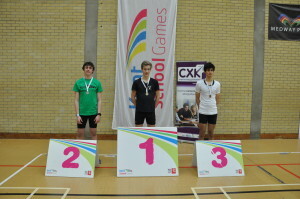 In the individual 2000 metre event Hall and Mills battled rowers King’s School, Canterbury for the medal placings. Hall secured second place in a time of 6 minutes and 58 seconds, whilst Mills missed out finishing fourth overall in 7 minutes 06 seconds with Stothart finishing in 7 minutes 29 seconds and Mackintosh completing the distance in 7 minutes 53 seconds. 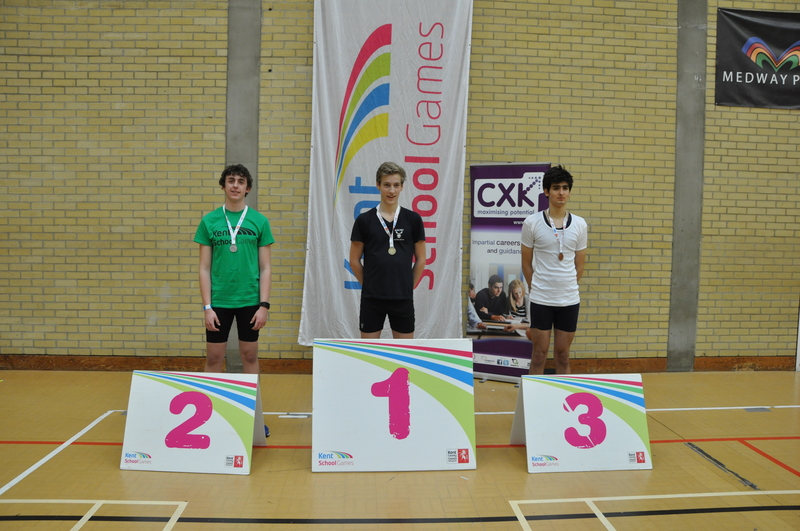 In the 4 minute relay event the Dover boys again were matched against King’s School in the battle for the top spot. The running order saw Mills lead off followed by Mackintosh, Stothart with Hall on the closing leg. 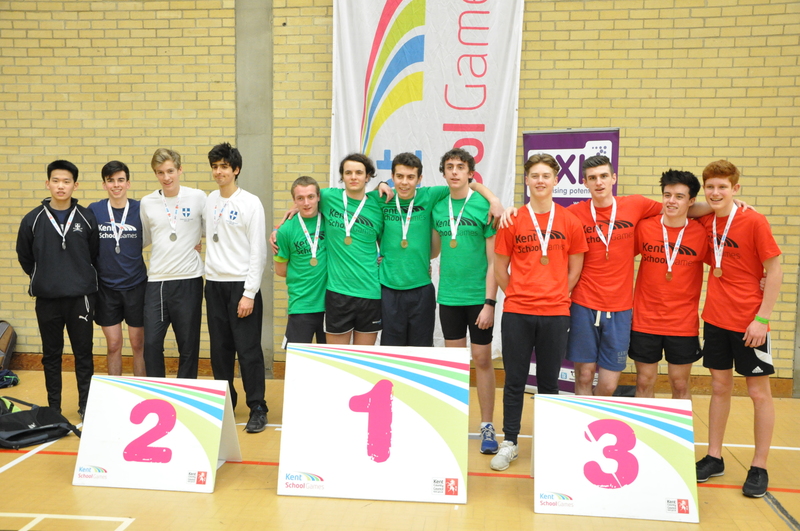 The team finished with 1289 metres seeing them take first place by 11 metres.